Providing top-k typical relevant keyword queries would benefit the users who cannot formulate appropriate queries to express their imprecise query intentions. 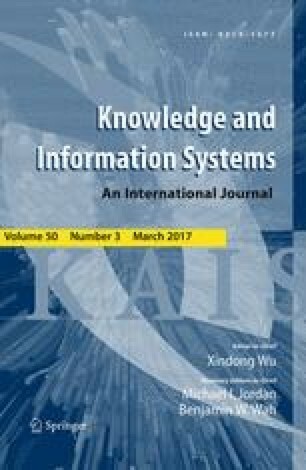 By extracting the semantic relationships both between keywords and keyword queries, this paper proposes a new keyword query suggestion approach which can provide typical and semantically related queries to the given query. Firstly, a keyword coupling relationship measure, which considers both intra- and inter-couplings between each pair of keywords, is proposed. Then, the semantic similarity of different keyword queries can be measured by using a semantic matrix, in which the coupling relationships between keywords in queries are reserved. Based on the query semantic similarities, we next propose an approximation algorithm to find the most typical queries from query history by using the probability density estimation method. Lastly, a threshold-based top-k query selection method is proposed to expeditiously evaluate the top-k typical relevant queries. We demonstrate that our keyword coupling relationship and query semantic similarity measures can capture the coupling relationships between keywords and semantic similarities between keyword queries accurately. The efficiency of query typicality analysis and top-k query selection algorithm is also demonstrated. This work is supported by the National Science Foundation for Young Scientists of China (No. 61003162) and the Young Scholars Growth Plan of Liaoning (No. LJQ2013038).